Greetings from the Gartner Symposium, a gathering of over 9,000 senior IT executives and CIOs. There were several sessions on vendor negotiations as well as the ITExpo where close to 300 vendors were exhibiting their products and/or services. First I’ll talk about the highlights of the vendor negotiation sessions and then short descriptions of some of the vendor booths I visited. First of all we all have to acknowledge that vendors are pros at negotiations, they do this full time while IT management only does it when they need to. And you never know if you got a good deal as confidentiality clauses prevent you from comparing your licencing costs with other CIOs. The most important point is, that once a contract is signed, that’s it! 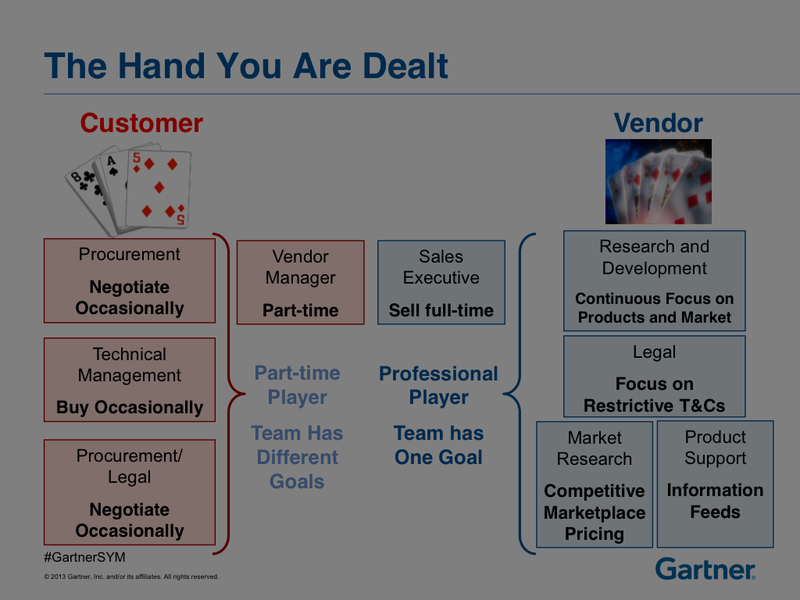 You as the client have no more choice, there is no competition, you are tied to that vendor. So licence negotiations must be done carefully with a plan and, if possible, with an outside expert assisting you. Why the stern warnings? Switching from a vendor like Oracle to another vendor is 3to 7times cost of licensing; it just can’t be justified financially. There is also no secondary market for surplus licenses, once you signed the contract, you are licenced to use the product, and if you overbought the number of licences or have licences to the wrong software features, you are stuck with them. In Europe it is different, the European Parliament declared that the primary rights of the vendor stop once the sale is made. There are no such rulings in North America, hence licences can’t be resold. The other reason you have to be careful about signing software licensing contracts is that it keeps on costing your organization for years. On the average, annual software maintenance prices are 22 per cent of the licensing fee. You have to pay the fee even if you don’t use the maintenance service. It is very difficult to negotiate a reduction in maintenance costs as this is very profitable for the vendors with an upto 85 per cent margin and for some of them maintenance revenue is 50 per cent of their total revenue. There are a few organizations that offer third party support for, such as Oracle and Microsoft. The largest of them is Rimini street at 700 customers. I hear you saying, I can always cancel some of the unused licences . You could but then you have to renegotiate the contract and the vendor may up the maintenance fee as you may not qualify for a volume discount. If large vendors continue in this direction, with the potential increase of smart machines, software licensing costs will dramatically increase.The increase will be larger if for example you have SAP system tracking the items that were sold from a self serve machine, and the inventory was updated on the database every time an item is sold. Would the self serve machine have to have an SAP licence? These are the type of issues that need to be discussed at licence negotiation time. They manage mobile devices (device data, voice and SMS usage in real time) and control costs (useful for all those frequent travellers). Tangoe is a large organization with 2000 employees and have clients like Rogers and PriceWaterhoueCoopers. They have all the right buzzwords!